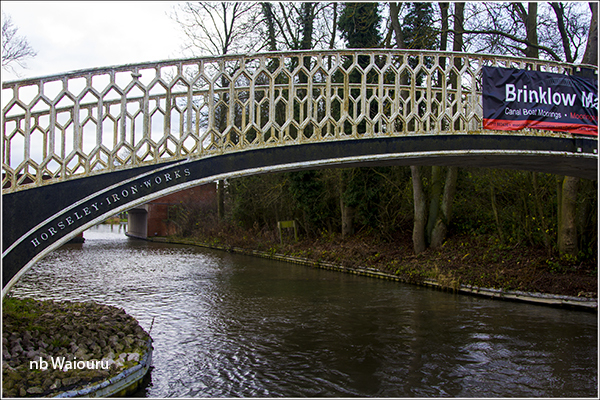 We departed from Brinklow Marina after paying the electricity account (£4.50) and returning the gate key. Daniel took control of the tiller which gave me the rare opportunity to use the camera and study the scenery in detail. 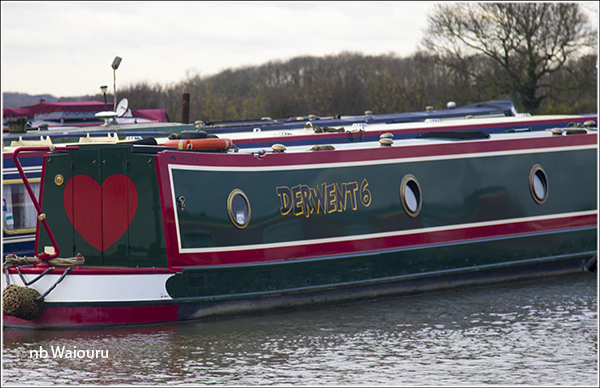 I did notice a number of familiar boats were moored in the Marina. 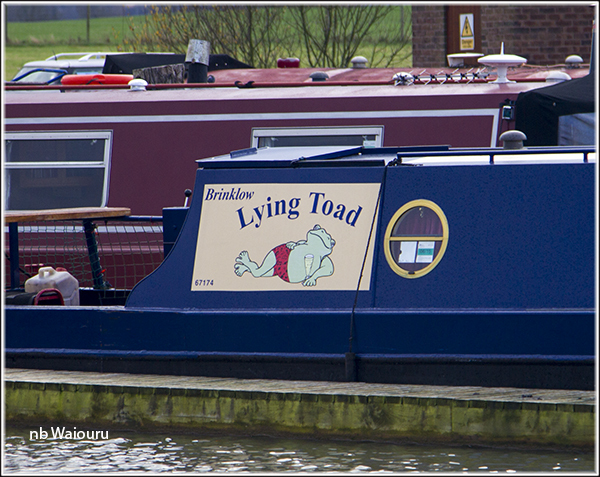 I think this boat is named after someone I know from an earlier career. Daniel managed the turn out of the marina without having to resort to the ‘electric pole’. The marina staff we met were very friendly and the isolation of the location probably enhances the security. But it’s two miles to the nearest public transport which means a car is probably necessary if you were going to leave the boat moored there. It’s probably more isolated than Barby Marina. It was a slow and quiet cruise towards Rugby. Partially because Daniel was refreshing himself with his steering, but mostly because we had something around the propeller which he couldn’t shake off with bursts of reverse. 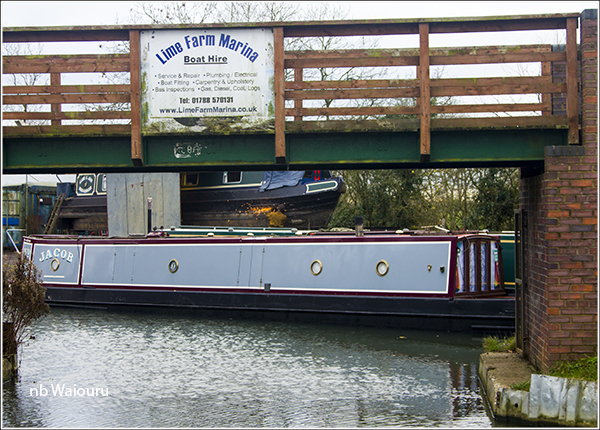 Someone was working on a boat in Lime Farm Marina. nb Lois Jane has gone. She is actually moored in front of us. 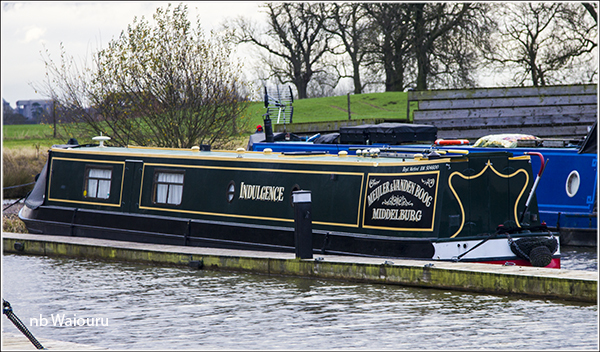 Daniel found a vacant mooring on the towpath side at Brownsover. NB Peruvian Skies was behind us but has since left. We did some shopping in Range (new 4.5 tog duvet) and Maplin before returning to Waiouru. Daniel headed to the railway station and on to Belgium whilst I walked into Rugby to collect the switch labels I’d ordered. I have been referring the requirement to go down the weed hatch to remove whatever is around the propeller. The water looks damned cold and although Jan’s comment that “You should pour a bucket of hot water down it before starting!” makes some sense (it might briefly raise the temperature of the local water) I decided to do it commando style. Just my luck to find a particularly heavy duty plastic bag entangled around both the shaft and propeller. I eventually freed it with the assistance of the serrated bread knife……... just as I was starting to lose the feeling in my hands. Next time I’ll try the bucket of hot water technique! We use a pair of gloves very like these http://www.suttons.co.uk/Gardening/Garden+Equipment/Pond+Care/Long+Arm+Pond+Gloves_MH1817.htm instead of hot water. One of the very first bits of boating advice I got was that when you need to go down the weedhatch, put the kettle on first; make tea, then pour the rest of the hot water down the weedhatch. We have the gloves. Just too lazy to retrieve them from the long term storage area!